The most dangerous thing about using a Registry cleaning tool is to believe the hype that comes with it: if you take what you read as fact, running the tool and letting it delete dozens – if not hundreds – of supposedly obsolete entries will help you speed up your PC. On a severely clogged up computer this myth might even be proved true after the first couple of scans, but then strange things start to happen, which can’t be traced to an obvious cause and which ultimately cause more frustration than persevering with a slow computer. Registry cleaning tools should be treated with caution, and Wise Registry Cleaner Free at least does that, allowing you to create both a System Restore point and backup of your Registry before you start using the program. The program will then scan your system for problematic entries and provide you with a summary where it tells you how many of these can be “safely” removed, and which ones should be left alone. Click Fix and the program automatically backs up the keys about to be removed, so if problems do occur, you can then restore your backup quickly and easily. Despite these fail-safes, we still recommend going through each of the categories manually reviewing what’s been marked for deletion, and unticking anything you don’t immediately recognise. After deleting these entries, you’ll notice a defrag button: click this and the Registry files will be compacted and defragmented when you next start your PC – if performance can be improved, it’s here that it’ll actually happen, and you don’t need to delete any Registry entries to do so. 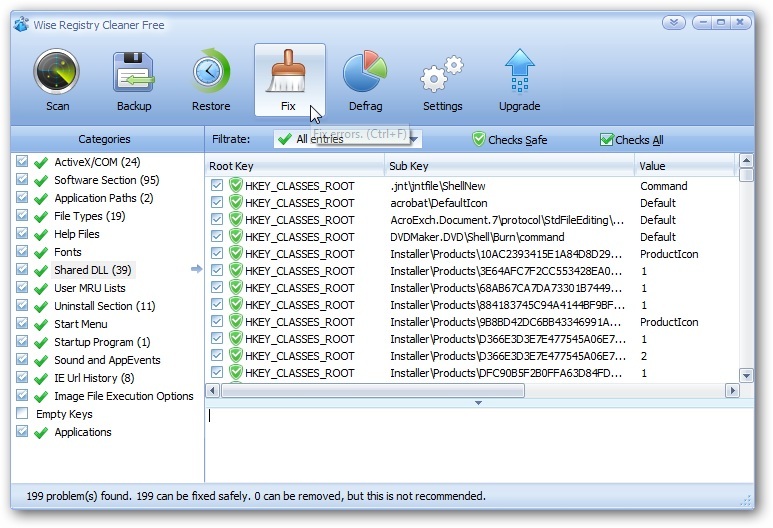 Competent Registry cleaning tool, with plenty of fail-safes should the program prove – like many other Registry cleaners – to be overzealous.